There are two important steps when migrating a Magento Stack: create a backup of your system and database on the old server, and restore it to the new one. To make this process easier, divide them into four sub-steps. 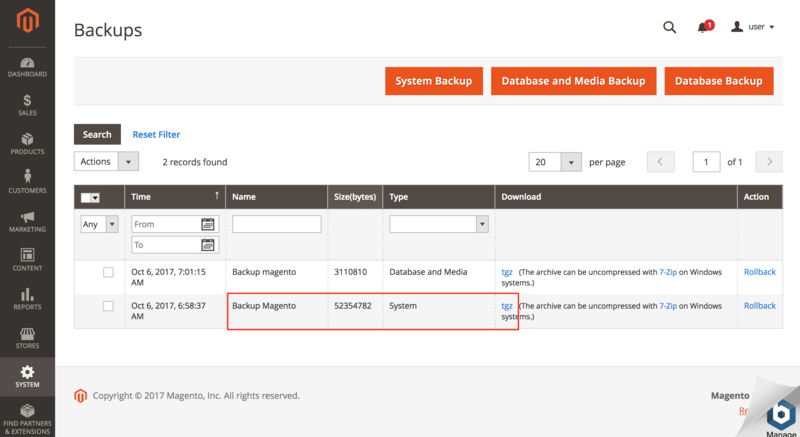 Create a system backup using the Magento admin interface section. Remember to select the “System Backup” option. TIP: You can enable the maintenance mode while creating the backup. Visitors will see a “Service Temporarily Unavailable” message in their web browsers instead of the store. Once the backup has been created, you will see your backup in the list of available backup files. Select the one you have created and click on the tgz link to download it. Create a database backup. You can do this manually or with phpMyAdmin. If you use phpMyAdmin, export it as an .sql file. Download the resulting .sql file. If you created the database backup using phpMyAdmin, the file was automatically downloaded. If you created the database backup manually, download the file from your server with SFTP. You can follow these instructions by changing the action from “Upload” to “Download”. In this step, you just need to upload the Magento installation backup file to the machine where you have installed the new Magento. Upload the file to the new server with SFTP. Then, move it to the /opt/bitnami/apps/magento/htdocs/ directory. Upload the .sql file to the new server with SFTP. Restore the database by following these instructions. To complete the migration of your old Magento installation to the new one, you need to replace some directories and delete some others in order to save space and clear some useless data. Open the /opt/bitnami/apps/magento/htdocs/app/etc/env.php file, check the password, host, port and user values and replace them with the values of your new Magento installation. Now, you should be able to access the new Magento admin panel using the password of your old server. The migration of your old Magento installation has been completed.